I have been married for nearly a quarter of a century. One of the most difficult lessons I have had to learn is the lesson that my lovely wife is usually–NO practically always right. I confess I do not always like her approach, but–time bears out that she was on the mark with her assessments. It was the same with Isaac and Rebekah. Rebekah heard God say–Joseph will rule Esau. Throughout their lives, however, Isaac favored his burley Man’s man son Esau. So when it came time to give the final blessing–there was a conflict. Rebekah took the matters into her own hands–she built an elaborate plan to achieve the right result. It put Jacob in a bad place–he had to lie, cheat and steal the blessing to achieve God’s plan. Everybody would lose. Still, Rebekah was willing to take the shot–to see her son properly blessed. It could have been avoided had Isaac simply accepted God’s plan–but, he didn’t. In addition, Esau was not a guy that was willing to accept God’s plan in any part of his life–especially as it relates to following God in building a God honoring nation. I am consistently looking to follow the Lord in my life–As time has passed, I have learned that my wife is usually laser pointed on when I am not listening or not following his lead. What’s more–if I listen, she will identify the key element that I miss and often sees what is best for our family. It is not easy, I have to admit I am a bit dense…(HA! A BIT!!) and then take her wisdom and pray it through–but when we are aligned–God does amazing things in our lives and the lives of our family. Thanks God for giving me a Godly wife! Kids! Isaac and Rebekah loved their kids. Parents do that. They carefully feed and nurse them as infants. They raise them with the valued principles of God and life as youngsters. As they mature they provide the best example of adult life possible–showing the transparency and frailty of all humans. Then as adults, they pray, hope, celebrate and grieve with the young adults they have to release to be their own persons. Such was the case with Isaac and Rebekah. Jacob was the worker, the quiet and unassuming brother. He was smart, insightful and a bit crafty…Esau was “Gaston”–rugged hunter, conceited and in his mind, invincible. He was a superhero by the world standard. So to him, rules did not apply. That broke his folks heart–birthright, marriage and general attitude toward God was aligned with his Canaanite in-laws much more than with his family. In our culture, we are not a great deal different. We simply want to raise kids that will not be entangled and entrapped by the world. We want them to enjoy the peace and purposeful life–only available if they walk with the Lord. Still, no matter how hard we work, we have to let them go. They get to make their choices and often can break our hearts. We continue to counsel and pray for them–but, then we have to step back and let them be adults. Such pain and grief is hard to bear. The only good news was given to us by Solomon in Proverbs 22:6, “Raise a child in the way they should go, and, when they are old, they will not depart far from it!” God wants us to remember he loves them even more than we do–Like us, he will never give up!!! When Esau was forty years old, he married Judith daughter of Beeri the Hittite, and also Basemath daughter of Elon the Hittite. 35 They were a source of grief to Isaac and Rebekah. One has to question the lame excuse of these men of God–She is my sister, again–really. I imagine it is not a big deal in the grand scheme of things, but, in that culture it was clear that life was not valued greatly. Isaac was genuinely concerned for his life–but, at the cost of bringing shame to himself, Rebekah and all he was there to accomplish. God led him to that place. He kept him away from Egypt. God told him he would keep him safe–and Isaac believed God, mostly? Truth is, God would protect Isaac and Rebekah had he just been honest and transparent–He put sufficient fear in the godless king to cause him to make a death warrant for anyone that dared touch Isaac’s family. Isaac should have been confident in God–the God that had always been faithful. We should also be confident in the God who has always been faithful. In most lives–including ours; life’s circumstances bring a mixture of joy and sadness; confidence and fear. God tells us to be content–in whatever circumstances–a directive that a loving father would only give if he had a plan to prepare us and carry us in each and every one of them. I am often times slow to see God’s plan. It is not that I am stupid–it is simply that I am impatient. So I, we–need to trust him, follow him and wait on his timing so that he can maximize the training, blessing and preparation along the way. There is no accounting for what drives people. Isaac waited a quarter century to have sons. When his sons arrived, there was a clear distinction; Esau was a burley–“Man’s man” and Jacob was an inside guy. God told Isaac and Sarah–Jacob would continue the lineage–but, Isaac loved Esau. He loved his talent, his rugged style and the yummy food he made. So much so, that Esau clearly felt confident he had his future made. He became cocky–self absorbed–his God was his stomach. Esau felt like the rules were not made for him; so, when Jacob offered him a nice dinner for the family birthright–well, there was no question that he would take the soup. Esau was all about now. He worried about his next meal, his next hunt and his next desire–long term thought was simply not a part of his routine. When Jacob traded him the soup for birthright–it spoke volumes of the hearts of the men. Esau never desired the responsibility of continuing the family line–he only wanted to hunt and fill his stomach. In our world, not much has changed. Most folks are like Esau–self-absorbed and self-reliant. Their concern is for today, for themselves and not for God. People admire their rugged style, their false bravado and the way they take care of themselves. The truth is–it takes an eternal perspective to see past the here and now. When people live for eternity–the world feels they are foolish, weird and out of touch with the times. Truth is, however, it is that perspective–that will change the world. We have to look beyond our personal needs and trust God for who we are and what we have. That is the only life that will leave a legacy. Those who live for now will only leave stuff and emptiness. Paul spoke of those people as the enemies of God in Philippians 3–“Their God is their stomach and they glory in their shame.” In short–Esau was not an enemy of his birthright, He was an enemy of God. The boys grew up, and Esau became a skillful hunter, a man of the open country, while Jacob was content to stay at home among the tents. 28 Isaac, who had a taste for wild game, loved Esau, but Rebekah loved Jacob. The building of a lineage is no small task. Isaac was charged with the duty of continuing the line. Now, his half-brother Ishmael had 12 sons and would have been glad to take the job, but God was clear–The lineage would come through Isaac. Like his dad, however, Isaac had to wait a quarter century to see his kids be born. Rebekah was like Sarah–she was barren. So Isaac did what he did when he sought a wife, he prayed, and prayed. God was kind and gave him twins–once again, God did exceeding and abundantly more than Isaac could have imagined. But, there was a catch, the older would serve the younger–From the start, that would not play well. But, God’s plan was perfect, so as Jacob and Esau entered the world, God was kind enough to let their parents know how things would progress. One cannot put a value on a life without including the legacy left behind. 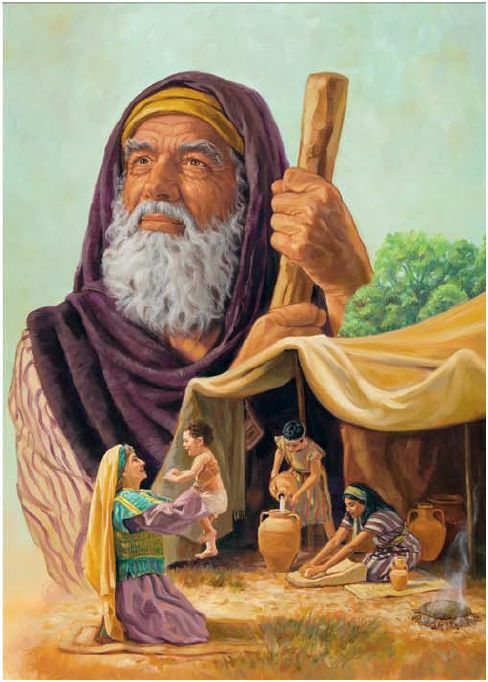 In review, Abraham lived a century after he was called by God to leave home and go to Canaan. In that time, he built a family and a fortune that was not only amazing, but he did it owning no more land than the land used to bury the family dead. He waited until 100 to see the heir of his legacy, but, in the years to come had numerous sons that ultimately spread out over the Middle East. Abraham listened to God; and, while he blessed all his children–there could only be one heir, Isaac. Isaac was set apart and was blessed by God and Abraham. In that, Abraham completed his part of his covenant with God. Abraham’s legacy not only included his Son, but, it included mostly–a life of faith and faithful living. It is great that our lives are not determined by one event. Instead, our story is a combination of several small choices and great experiences. All of our lives include amazing joys and horrific tragedies. Our greatest legacy, however, is the same legacy as Abraham’s–faith and faithfulness. As we walk forward, we will impact our families, our friends and all lives we touch. Our devotion to God, will color our view and the view of our children in the age to come. We have to live lives that display trust, humility and grateful heart toward the Lord God. Then, we too will be like Abraham and will leave an amazing legacy. Abraham had taken another wife, whose name was Keturah. 2 She bore him Zimran, Jokshan, Medan, Midian, Ishbak and Shuah. 3 Jokshan was the father of Sheba and Dedan; the descendants of Dedan were the Ashurites, the Letushites and the Leummites. 4 The sons of Midian were Ephah, Epher, Hanok, Abida and Eldaah. All these were descendants of Keturah.5 Abraham left everything he owned to Isaac. 6 But while he was still living, he gave gifts to the sons of his concubines and sent them away from his son Isaac to the land of the east. It is great, when a plan works. As God prepared the heart of Abraham and Isaac in Canaan–he was doing the same in Haran for Abraham’s family. When given the story, not only was the family willing to step out in faith–but, Rebekah was also willing to trust God and leave the safety of home to go meet this Isaac. What’s more, after traveling back through the desert, they arrive back at Abraham’s home only to find Isaac in prayer. It was clear that God was a centerpiece in the lives of the family that Abraham’s Dad, Terah, raised. That framework, was the very driving force that pushed his son to seek his daughter-in-law from a family with the same heritage and faith. One can never underestimate the power of one’s lineage and family values. It is the power of those values and traditions, that saved humanity during the time of Noah. Those values made Abraham a nomad for 25+ years, while he waited on God to provide an heir. It is the same values that keep his chosen today praying for like-minded families to raise spouses for their kids. We pray for the spouses for our kids daily. from their youth, we have instilled the critical nature of marrying Godly spouses that will be aligned in faith–to journey together. It is no small thing–as seen in the life of Abraham, to properly raise and prepare your kids to marry Godly spouses. That is how faith travels through the lineage from Seth to Noah; from Shem to Abraham and finally from Abraham to Jesus. Since prayer is the greater work, families must pray for unity and faith to continue as a family trait and tradition. The world will hate it, and it becomes more difficult as each generation passes–but, with God, ALL things are possible.